The first full day of the Sts. Sebastian and Mardarije Orthodox Institute began early Wednesday morning, 27 February the feast day of St. Cyril Equal of the Apostles, teacher of the Slavs, with the Holy Hierarchical Divine Liturgy. His Grace Bishop Ignjatije of Branichevo officiated at the Eucharistic gathering with the concelebration of Their Graces: Bishop Longin of New Gracanica and Midwest America, Bishop Mitrophan of Canada and Bishop Maxim of Western America, together with clergy from dioceses nationwide. During the liturgy, Deacon John Suvak was ordained to the priesthood. 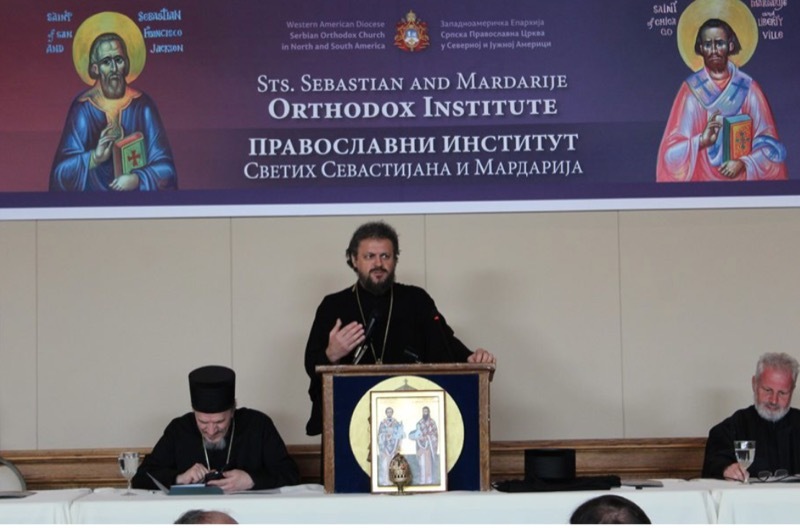 In his lecture series entitled “The Catholicity of the Church“ Bishop Ignjatije began by explaining the difference in the western and eastern grasp of catholicity. While catholicity is identified with universality in the west, the eastern understanding identifies it with the eucharistic community. The liturgy announces the future kingdom of God in which the bishop is an icon of Christ, the priest serves as an icon of the apostles, the deacons serve as icons of the angels and the people are the people of God. One liturgical community cannot be what it is unless it is in communion with others. This is seen, for instance, in the rite of the consecration of the bishop which is done by two or three other bishops. This means that what constitutes a community dependson the other communities. In one church enter all other churches. This is furthermore developed in patristic thought which directs us to the teaching of God in the Trinity in which the church is an image of God. Just as the Father, for instance, cannot be a “father“ without a son the church community cannot exist without the other communities, that is, without being in communion with the others. This theology is reflected in the very makeup of the church, in which autocephaly of a church cannot be received without the other communities. This is evident in the autocephaly of our Serbian Church whose 800th anniversary we are commemorating this year. Contrary to this is the rise in the emphasis of nationalism in which more stress is put on the nation so that all of the sudden instead of seeing unity we focus on the differences between the Greek Church, Russian Church, etc. This is something that does not enter in the identity of the church. 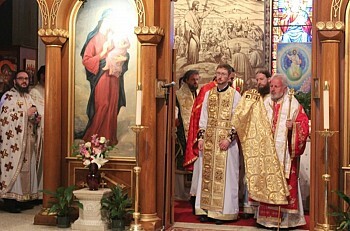 Therefore, while in the west catholicity depends on universality, on the one who is the head, in the east the eucharistic community has a leader (based on Apostolic Canon 34: It behooves the Bishops of every nation to know the one among them who is the premier or chief, and to recognize him as their head, and to refrain from doing anything superfluous without his advice and approval…) but this leader is connected – in eucharistic community – with the others. After lunch and an afternoon break in his following talk, entitled “Rediscovering our True Self in our Neighbor“, Bishop Ignjatije continued this idea of community. We are given a commandment to love our neighbor as ourselves and the question one poses to oneself: am I fulfilling this commandment if, even though I might not love my neighbor, I don’t do anything to interfere in his affairs? This, in turn, is because man is viewed as an individual. What’s more, Christ is transferred in the minds of contemporary man somewhere in the heavens, far away, so that many think that they don’t need the church because their grasp of faith is individualistic. But the understanding of the Eastern Fathers was of God as a community. What’s more, the individuality of a person comes not from himself but other – from the community: the community makes that person a unique individual. Subsequently, when one passes away it’s considered a loss for the community. In this light, Christianity is not to be understood as a set credal formula – but Christianity is a community. This is seen particularly in the phenomena of zealots who attach themselves so much to the dogmas, canons, and rules of the church thatthose who disagree no longer exist for them. And here we see the very problem, or, as an old Latin proverb says unus cristianus nulus cristianus – one Christian is equal to no Christian. Faith is only understood in the context of the community and thus this commandment to love our neighbor as ourselves. For a person cannot exist alone without a connection with another who gives him a personal existence. This communion is necessary in order for man to live as a person. Earlier in the day the newly published monograph The Serbian Christian Heritage of America was presented to the clergy and laity. This monumental book consists of 1000 pages with over 700 photos of the most important historical figures, churches, parishes, monasteries, frescoes, icons, and other art objects. It contains professional texts of prominent historians, theologians, artists, and others who are leading experts in the areas from which they write. It is a book that definitely belongs in every Christian home. After the evening Vespers, served by Rev. Vladislav Golic, and dinner the first full day of activities came to an end.